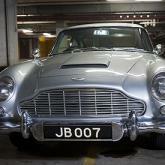 An American car enthusiast has paid £2.6m to buy James Bond's most famous car - and then vowed to take it for a spin around the streets of London. The 1964 Aston Martin DB5, which boasts revolving licence plates, ejector seat and bullet-proof shield, featured in the films Goldfinger and Thunderball. The silver model is still capable of 145mph and 0-60mph in 7.1 seconds. It was bought at a London auction by collector Harry Yeaggy, who will display it at a car museum in Ohio. It was previously owned by a US broadcasting boss who paid $12,000 in 1969. After his winning bid was accepted, Mr Yeaggy revealed that it has been "a last-minute decision" to fly into London for the auction and that he had spent a little more than he had planned. He explained: "I thought a European would buy it. But I guess they didn't appreciate Bond as much as we do." And having paid out such a sum, he said he was determined to get his money's worth: "We're going to fire the car up and drive it around the streets of London tonight. We're going to have a bit of fun with it." The car is said to be in excellent condition and, as well as its other spy accessories, contains an early version of the modern-day satellite navigation system. It is the only surviving example of two Aston Martins used in the early Bond films, after the other was reported stolen in 1997. Bond's creator Ian Fleming had originally envisaged his British spy in a Bentley, but the Aston Martin was preferred by film-makers for its enthralling combination of Italian design and British engineering, analysts say. A less sophisticated version of the car was released in the UK in 1963. It had a top speed of 145 mph (233 km/h). The proceeds of the sale will go to previous owner Jerry Lee's charitable foundation supporting education and anti-crime projects internationally.